Only stunning visual quality and you imagination! An out-of-the-box AR solution for home improvement. Now you can see products at home before actually buying them! 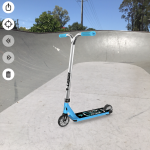 View all the products in actual real-life size and from all possible angles in high quality 3D and see all the relevant additional information, client reviews and ratings. You can view the furniture and other goods from different angles and try out different colors. 100% accuracy with Google Project Tango devices! Download ready designs from professional designers and apply them to your home instantly! Personalize products right on the spot! Make full plans of kitchens and living rooms. No more arriving home from the store only to find your new couch is too big for your space or the dining room chairs you bought are too short for your table! Home interior design helping wizard – intellectual assistant. Overlay existing furniture, walls, floor, etc. in AR. Build a new design over your existing room! AR how-to manuals for your DIY home improvement. Buy AR room designs from designers and view them in your home instantly! Recommend furniture and tips to friends. Inspire and be inspired! Post likes, share designs with your friends via social media, rate their designs and view them in your own room. Use app in actual store – save storage space, time and effort for your staff and still showcase all your products in an easier and faster way!